Apple is busy working on the new iPhone 11 to take on the Samsung Galaxy S10 and Huawei P30 Pro and it looks like it may have the in-screen fingerprint reader and triple lens camera to do it. 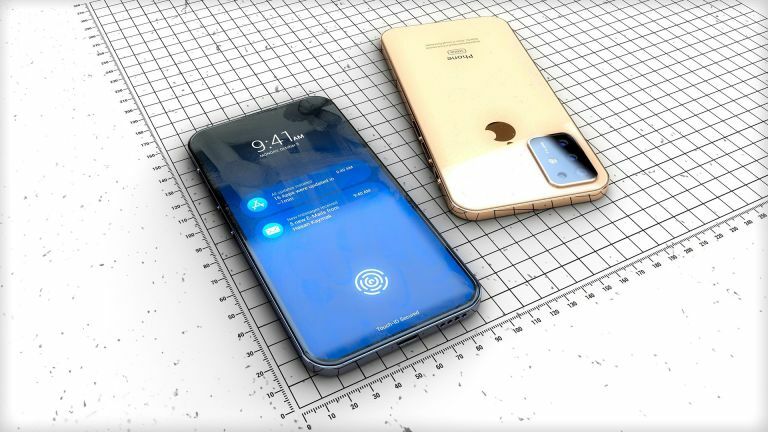 The newly released video shows off renders of the iPhone 11 concept from Hasan Kaymak. This takes recent rumours and combines them with design stylising from the latest iPad Pro. As you can see in the video below the hopes for the next major Apple iPhone overhaul are high as a lot of changes appear afoot. The current iPhone XS and iPhone XS Max sport dual cameras on the rear and notch screens on the front. The new iPhone 11 concept shows a device that is far more future focused with features that will help Apple compete against the hastily updating Android competition. Yup, even with the rumoured five camera Nokia 9 PureView. The video shows off the iPhone 11 with a smaller notch so there could still be Face ID. However this also features an in-display fingerprint reader, something lots of other manufacturers are adding this year. On the rear is a triple lens camera with laser autofocus. Adding another lens might upgrade the iPhone XS but it could still leave Apple behind the competition as lots of Android phones are expected to sport quad lenses this year. While that iPad Pro design does look great, Apple is going to have to work very hard to earn its top-spot in 2019 as foldable phones and 5G smartphones start to shake up the market. Apple is expected to launch the iPhone 11 in September.